Children of all ages will delight in the thrilling, once-in-a-lifetime opportunity to drive two iconic supercars. All under the safe, watchful guidance of professional driving instructors who’ll teach them the rules of the road. 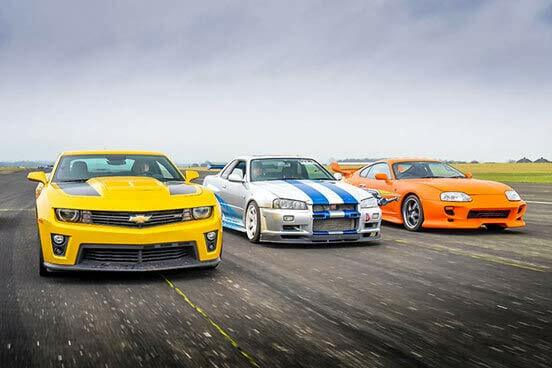 Youngsters can choose from iconic supercars like the Camaro ZL1, made famous as Bumblebee from Transformers. Known across the globe, this yellow sports car is an original muscle car, purposely built to challenge the world’s most advanced sports cars. Alternatively, kids can get behind the wheel of the Nissan Skyline, the same model Brian O’Conner drove in The Fast and the Furious. According to Top Gear, this might be the fastest car in the entire world when it comes to cross-country trips. A supercar track day allows you to build memories with your kids and encourages them to love motorcars as much as you do! Your young driver’s day at the race track will begin with a welcome registration and safety briefing, where you’ll learn about driving theories, and the fastest and safest driving techniques. Once they’ve been prepped, it’s time to put pedal to the metal and practice their skills on the circuit. They’ll then get to take three adrenaline-fuelled, hair-raising laps in each of the chosen supercars under the guidance of trained professionals. It’s guaranteed to be one epic junior supercar experience. A £10 supplement charge applies for Saturday bookings at the Blyton location. A £25 supplement fee applies for visits to Dunsfold, Blyton Park or Castle Combe venues. The person driving the car will be required to sign a disclaimer accepting liability in the event of damage to the vehicle. The driver can purchase optional damage waiver cover when the booking is made to minimise their financial exposure should there be an accident. Full details available at the time of booking. This experience is available Monday to Sunday, subject to availability, throughout the year. You will typically spend 2-3 hours at the venue. This experience is for one person, there will be other people there on the day. You are welcome to bring friends and family to watch you take to the track! The minimum age for this experience is 10 years old, you must be accompanied by an adult.